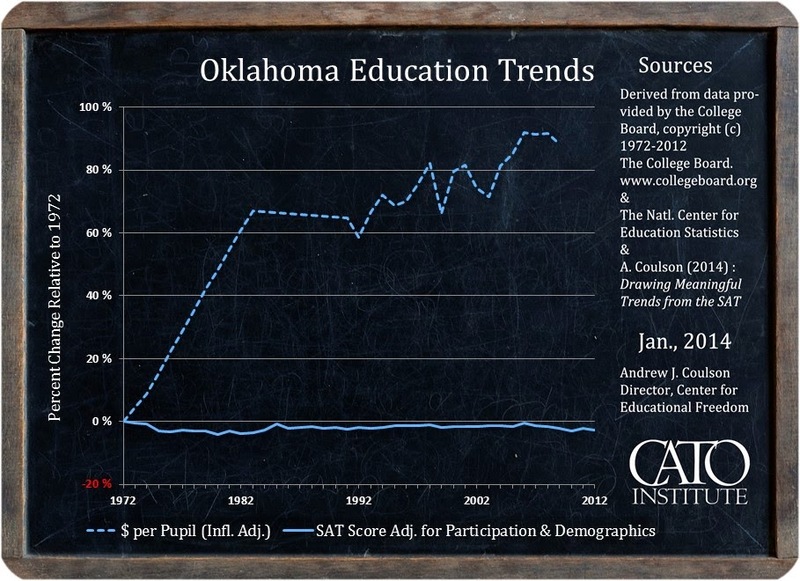 On the CBS affiliate in Oklahoma City, Patrick McGuigan points out (at the 5:11 mark) that public education in this state has abundant revenues, and that administrative-overhead growth has been startling. I saw it today and I highly recommend it. It premieres March 31 on YouTube. Positive Tomorrows serves as the only school in Oklahoma for homeless children, The Oklahoman reports. And ESAs would enable the school to help even more children. "All over the world, smart countries are moving away from the outdated model of state education monopolies and allowing civil society back into education, where it belongs." Even as various school-employee labor unions and other members of the public-education community are preparing to converge on the state capitol March 31 for an “education funding rally,” a new study released yesterday suggests that "there is essentially no link" between state education spending and student performance. Using a time-series regression approach, Cato Institute scholar Andrew J. Coulson "adjusts state SAT score averages for factors such as participation rate and student demographics, which are known to affect outcomes, then validates the results against recent state-level National Assessment of Educational Progress (NAEP) test scores. This produces continuous, state-representative estimated SAT score trends reaching back to 1972. The present paper charts these trends against both inflation-adjusted per pupil spending and the raw, unadjusted SAT results, providing an unprecedented perspective on American education inputs and outcomes over the past 40 years." Coulson gives state-by-state results, but he says "the overall picture can be summarized in a single value: 0.075. That is the correlation between the spending and academic performance changes of the past 40 years, for all 50 states. Correlations are measured on a scale from 0 to 1, where 0 represents absolutely no correlation between two data series and 1 represents a perfect correlation. Anything below 0.3 or 0.4 is considered a weak correlation. The 0.075 figure reported here suggests that there is essentially no link between state education spending (which has exploded) and the performance of students at the end of high school (which has generally stagnated or declined)." As Stephen Moore points out, the Court said education spending isn't the only measure of "equity." James Tooley discusses low-cost ($1 per month) private schools run by entrepreneurs in some of the most destitute places on earth. Oh Horace, Horace, Horace. Where did it all go wrong? "The most important question is not whether Oklahoma taxpayers can afford to go on spending $10,483 per graduate every year, although that question matters," Greg Forster writes for OCPA. "The most important question is whether Oklahoma can afford to go on failing 10,529 students in every high school class, year after year. Schools, like students, need to learn to see a tough task through until it’s complete. And if they tell us they’re having too much trouble learning, reforms like school choice could help them get up to speed." "A 10-year-old boy with cerebral palsy hopes to raise $250,000 for his school," the Associated Press reports. Keith Boyd, who uses an assisted-language device that he operates with his eyes, is nonverbal and unable to move his body. He used the device to write a business plan for Keith's Ice Cold Lemonade Stand, a business he plans to launch in the spring. All proceeds would go to Little Light House, a Tulsa school for children with special needs. "Parental choice is eliminated as schools are pushed to have the same curriculum and textbooks," Oklahoma labor commissioner Mark Costello says. Cathy Spaulding of the Muskogee Phoenix has the story. "Each year," the Tulsa World reports, "Tulsa teachers sign an annual employment contract for 176 days of work, but by union-negotiated agreement, they are allowed up to 10 sick days and five personal days, plus 20 more work days off with substitute pay deducted from their paycheck." Just one more reason some scholars make the case that teachers are not underpaid. "Oklahoma conservative circles are abuzz over the breakdown of policy leadership at the Capitol," Andrew Spiropoulos writes this week in The Journal Record. "This past week, House Republicans refused to pass the session's principal school choice initiative out of committee and both the House and the Senate are reneging on their promise to restore tax relief passed last session." Read the whole thing here. State Rep. Tom Newell says he's not giving up.